Residents in "Villa Inflamable" are suffering the effects of living in a contaminated place; complaints about air, soil, and water pollution abound, but so do denial, confusion, and uncertainty about its extent and effects. “Villa Inflamable” or “Flammable” is located in the district of Avellaneda, right on the southeastern border of the city of Buenos Aires, adjacent to one of the largest petrochemical compounds in the country: Polo Petroquímico y Puerto Dock Sud. The Shell-Capsa refinery is the most important plant in that area, but the complex includes another refinery, Dapsa; three oil and derivatives storage plants (Petrobras, YPF and Petrolera Cono Sur); storage plants for chemical products (Tagsa, Antívari and Solvay Indupa, among others); a chemical products factory, Meranol; a dock for containers, Exolgan, and the Central Dock Sud thermoelectric power plant. The Shell Oil refinery opened here in 1931. Since then, other companies have moved into the compound. The name “Flammable” or "Villa Inflamable" date from 1984, there was a fire in the Perito Moreno, an oil ship that was harbored in a nearby canal. The ship exploded and produced what one elderly resident noted as the “highest flames I’ve ever seen.” In this neighborhood, around 6000 people are exposed to industrial pollution in precarious homes built on top of soil contaminated with toxic waste. Specifically, the children suffer from lead poisoning. According to a study supported by the Japanese International Cooperation Agency (JICA) in 2001, 50 percent of the children (7 to 11 years old) in “Villa Inflamable” have traces of lead in their blood and 10 percent with chlorine in their urine. Lead poisoning in children is defined by the U.S. Centers for Disease Control as a blood lead level of greater than 10 micrograms (µg) per decilitre of blood. Lead poisoning can cause learning disabilities and other chronic health problems, such as stunted growth, hyperactivity, and impaired hearing. 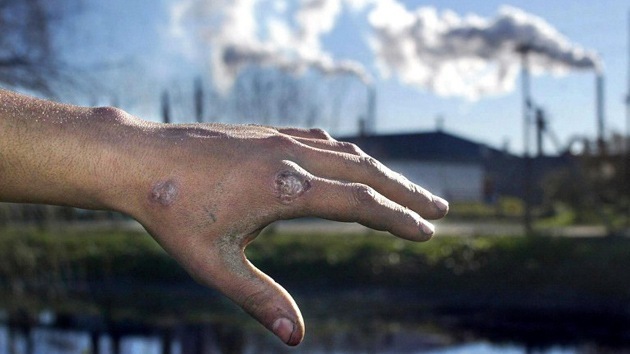 In July 2004 a group of residents living in “Villa Inflamble” filed a lawsuit against the Argentinian Government, Government of the city of Buenos Aires, and 44 businesses for damages to their health suffered as a result of the pollution. 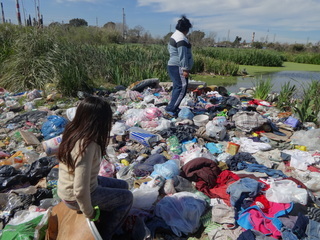 In 2008, the Supreme Court ordered the Matanza-Riachuelo Basin Authority (ACUMAR) to clean up the area. In 2011, ACUMAR established an integral environmental clean-up plan. The plan, whose goals include sustainable development, involves the reconversion of factories, the clean-up of rivers and riverbanks, garbage collection and treatment, water treatment and drainage works, and slum redevelopment or relocation. But this clean-up is slowly done and no visible results are seen up to now. The project covers a total of 1,600 projects to be completed by 2024, including the construction of 1,900 housing units, with a total investment of four billion dollars. However, relocation seems to be the only alternative: "According to the National Children’s Defence Office, for Villa Inflamable “there is no remedy possible.” What is needed is to relocate the families". The air, the water, and the soil are polluted. Women as “mothers” have an active role in this, they are the ones who typically mobilize, calling lawyers to make appointments and who travel to government offices to demand aid. Women also follow the news about possible relocation and compensation more closely. This case of environmental justice became famous after the study of Javier Auyero (scholar living in the US) and Deborah Swistun (an anthropologist, resident of Flammable) a in which they introduce the concept of “Environmental Suffering” that they defined as a "particular form of social suffering caused by the concrete polluting actions of specific actors and on the factors that mold the experience of this suffering" (Auyero and Swistun, 2009: 17) This specific case has not very visible mobilizations, however people is waiting to both compensation for damages and relocation, during the “long waiting” they still been affected by their toxic environment. Name Polo Petroquímico de Dock Sud en “Villa Inflamable”, Argentina. Project Details La refinería Shell-Capsa es la planta más importante en esa zona, pero el complejo incluye otra refinería, Dapsa; tres plantas de almacenamiento de petróleo y derivados (Petrobras, YPF y Petrolera Cono Sur); plantas de almacenamiento de productos químicos (Tagsa, Antívari y Solvay Indupa, entre otras); una fábrica de productos químicos, Meranol; una dársena para contenedores, Exolgan, y la usina termoeléctrica Central Dock Sud. Other Specific impacts on women as "mothers" very concerned about their children. Development of Alternatives -Dismantling the industrial complex. -Recolation seems to be the only alternative: "According to the National Children’s Defence Office, for Villa Inflamable “there is no remedy possible.” What is needed is to relocate the 800 families"
Why? Explain briefly. All the industries at Polo Petroquímico de Dock Sud still ongoing and the people still suffering the environmental and health damages of the toxic pollution. BOOK. 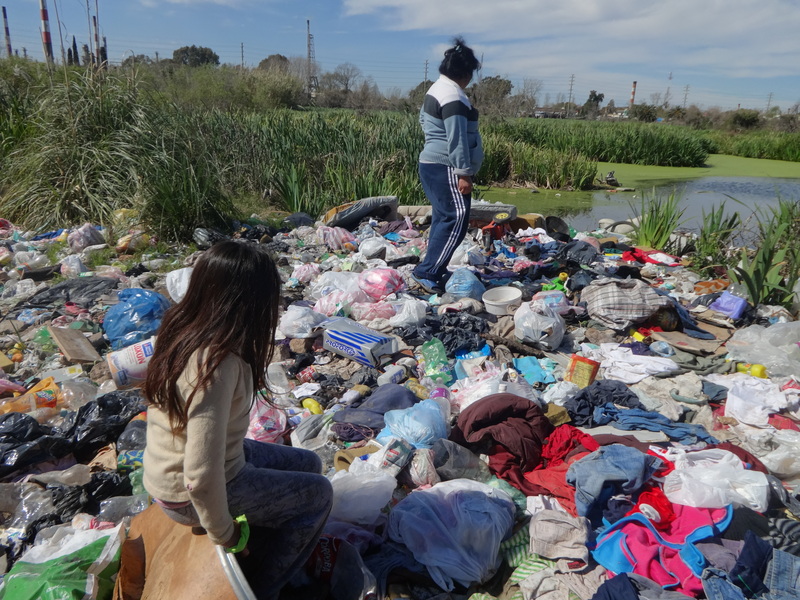 Auyero, Javier and Deborah Swistun (2009) Flammable: Environmental Suffering in an Argentine Shantytown. Oxford: Oxford University Press. 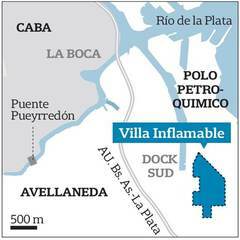 Villa Inflamable, una deuda argentina.